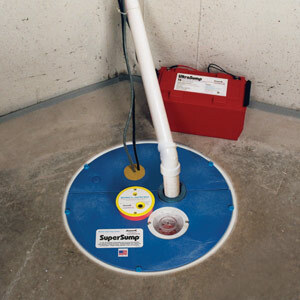 A sump pump can be an incredibly valuable resource in your home. When water gets into your basement, the sump pump is what protects you from a flood that could cause expensive property damage. If you've had issues with water in your basement -- and even if you haven't -- it's smart to protect your home with a quality sump pump from Advanced Basement Systems. If you're interested in adding a sump pump to your home, give us a call today at 1-844-320-1542 or click below to get started. We offer free estimates in London, Windsor, Chatham, Sarnia and throughout the surrounding areas. Problem: Even newer homes can have problem basements. This basement often felt damp and smelled musty. Excess water vapour was entering the space from the unsealed sump pump lid. Solution: To help control humidity, we installed the super quiet and efficient SaniDry™ Sedona Dehumidifier. It’s connected directly to their updated sump pump system, so with regular maintenance, these homeowners will never have to worry about excess moisture or a damp feeling basement again. Problem: These homeowners had an old sump pump system and pit which was open, creating a humid environment in the home. They were also experiencing some drainage problems and cracks in their basement floor. 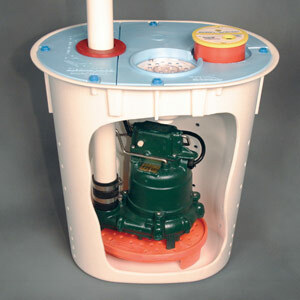 Solution: We successfully installed a new TripleSafe™ Sump Pump System and pit liner. We moved the location of their sump pump, filled in the old pit, filled the floor cracks and improved their drainage system. 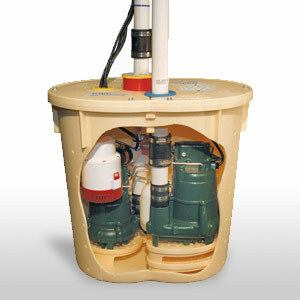 Solution: An important element of a dry crawl space is a reliable sump pump system. Without one, a crawl space will still be vulnerable to groundwater, as well as unnoticed plumbing leaks. Our SmartSump system is designed for crawl spaces. Problem: This small concrete crock houses an inefficient pump. It's very small and any rush of water could flood the basement. Solution: We removed the concrete crock and installed our attractive, large Super Sump unit. Problem: This basement was wet and damp in the area near the sump pump. The old sump pit was open, allowing excess moisture into the already damp basement environment, and the older pump simply wasn’t powerful enough to work effectively. The unlined pit allowed dirt and debris to clog the old pump. Solution: Our team waterproofed the leaky walls near the sump pump, dug out and formed a new pit, installed a TripleSafe Liner and inserted the super powerful Zoeller 1/3 hp sump pump. With this serious upgrade and regular maintenance, these homeowners are assured that their basement will stay healthy and dry – permanently! Problem: This sump pump does not have an air-tight lid and is letting lots of humidity into the basement because water is almost always resting in the bottom of the sump liner. Solution: We installed a customer lid, a new submersible pump and a battery back-up pumping system. Problem: This home in Port Lambton had significant and ongoing problems with water entering their basement even during modest rainfalls. Their old sump pump system was outdated, unreliable and needed replacement. The basement environment and the entire home was affected by this humid basement with musty smells and a damp feeling. Solution: This was an incredible transformation! Our team waterproofed the leaky walls, installed a perimeter drain, installed the best sump pump system on the market (with a battery backup in case of a power outage!) and finished it off with BrightWall® panels. BrightWall® is a 100% waterproof rigid plastic panelling for unfinished basement walls. It's durable, washable, and will not support the growth of mould or rot. These homeowners will now enjoy their clean and dry basement and healthier home. Problem: This multi-level home had one area which was a dirt floor crawl space. As with any lower level, this means water can penetrate up from the ground and cause water damage and excessive moisture. Solution: Our team installed a Super Sump: a sump pump designed for crawl spaces to remove the water in the ground. Our team also installed a CleanSpace vapour barrier, encapsulating the area; to keep the moisture and humidity levels down in the crawl space. Could not keep up during times of heavy rainfall. Did not have a battery backup in case of a power outage. Had an open pit: which allows dirt and debris to enter and potentially clog the pump. Solution: Our superior TripleSafe Sump Pump System is the perfect fit and fix for this home! Zoeller® ⅓ hp Primary Pump - Reliable and powerful! Zoeller® ⅓ hp Secondary Pump - If the primary sump pump fails or is overwhelmed by extremely heavy waters, the secondary pump will turn on. In the case of a tripped circuit, power outage, or sump failure, this system also includes an UltraSump® Battery Backup System. WaterWatch Alarm: Sounds off to let you know if water has risen past the point where the pumps should have turned on. Problem: Sump pump not able to keep up. Flooding occured. Solution: Basement Systems SuperSump installed with air tight lid, water watch alarm and perforated liner. Problem: An open sump pit, an older and singular sump pump equated to problems for this homeowner in Tecumseh. 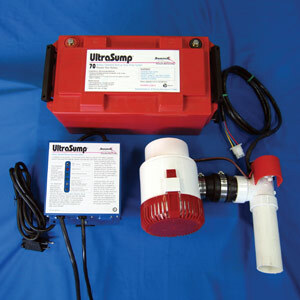 Solution: A dependable sump pump is one of the most important components of a dry basement.Our Advanced Basement Systems team installed the superior TripleSafe Sump Pump Kit. The TripleSafe provides three levels of protection; for normal functioning, the TripleSafe™ has a powerful, cast-iron Zoeller® ⅓ horsepower sump pump set at the lowest level. For heavy volumes of water or in case of primary pump failure, a second, more powerful Zoeller® ½ hp pump set a bit higher in the liner will take over. In case of a power outage, our UltraSump® battery backup sump pump, set at the highest level, will pump 11,500 gallons or more on a fully charged battery. All housed in a sealed pump liner – to keep humidity down in the basement. Ray Bates thank you for making this horrible experience with our parents house so much easier to deal with. Your professionalism and compassion shone thru when this family was falling apart. You have a great team of young men Justin Fysh that work very hard. Thank you SO much for a job well done! Very satisfied with work done. Great office staff and very good inspector. The installers were very good and friendly. 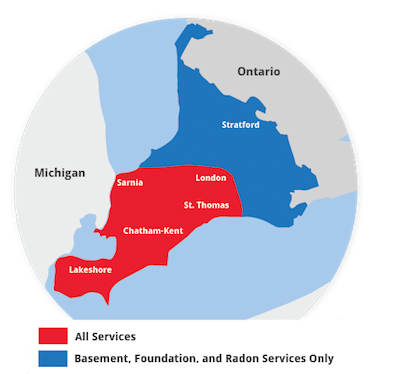 If you're interested in a new sump pump or any of our other basement waterproofing products, contact us today to request your free estimate in London, Windsor, Chatham, Sarnia, Windsor, Stratford, St Thomas, Leamington, Essex, Amherstburg, Strathroy or nearby. 6/5/15 - Sump Pumps and how they can help you and your home. 5/9/15 - Backup Sump Pumps and the Causes of Basement Flooding with Ben Bates.